In round two of my look at Macintosh pricing, we'll see how Apple compares in the $1,000 to $1,500 price range for laptops. If you didn't read the first article, Mac Pro Beats HP and Dell at Their Own Game: Price, we are comparing Apple against HP and Dell models with similar specifications. We agree that the other guys will sell you something for much less - but you are also getting much less. When I started on this round of Mac versus PC price comparisons, I thought my head was going to explode. I had to use duct tape wrapped around my head to keep it in one piece so I could finish. The number of seemingly meaningless choices was overwhelming. Let's look at what we have to compare for laptop computers. This time we'll pick on HP first; since HP swallowed Compaq, they seem to have extra choices. Apple has three laptop choices while HP has 14 different business models and 9 (more or less) different home models. Add all the possible custom configurations, and it makes a small army of decisions a shopper has to make. 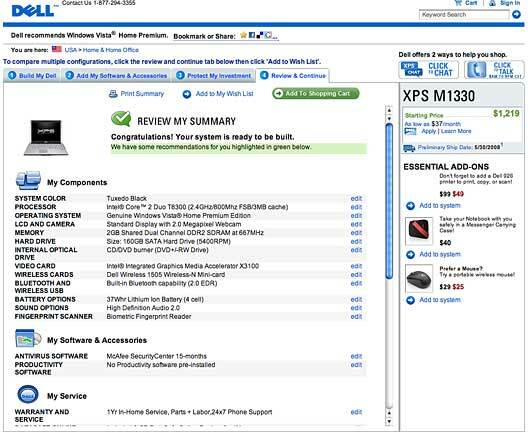 All that just to find your next laptop within one company's website. Now multiply this for every brand you want to look at. On the positive side, this variety is great because it allows you to pick the computer that is the perfect fit to your needs. On the negative side, this is simply confusing - and besides, buying a computer is not like buying wedding china. Computers are pretty darn flexible, so getting a close fit would probably be great if you could cut through all the complexity. I'm starting to understand why IT departments stick with Dell and HP: It is simply too much work to figure this mess out every time you need to buy a new computer. By sticking with one brand, you cut your choices down significantly - and then shop purely based on cost from there. The old IBM ThinkPad was great, because IT didn't have to think at all about which computer to buy. They had one simple area for laptop purchases. Too bad Lenovo screwed this up for them once they bought the brand from IBM. While this job of comparison-shopping may sound easy, 13" displays are standard for MacBooks, but there are none on HP's laptops. Most HP laptops have 14" or 15" displays. Their ultralight computers come with 12" displays, but because they are ultralight models, they are more expensive even though they use smaller displays. Since the budget HP notebooks come with 14" displays, I will assume that 14" is fair for comparison with 13.3" screen on the MacBook. There is simply no other way to compare. Another tricky difference is the whole home versus business thing that is common at HP and Dell. Apple doesn't tell us that only home users should buy a MacBook, while MacBook Pros are for businesses. The difference is more about basic model versus deluxe model. MacBook Pros are more expensive and have the full-featured specifications. If you've got the money, buy whichever model fits your needs, whether you are a home or business. I did my best to match things up, but there just aren't perfect comparisons. Still, except for a few details, I think the comparisons are fairly close. 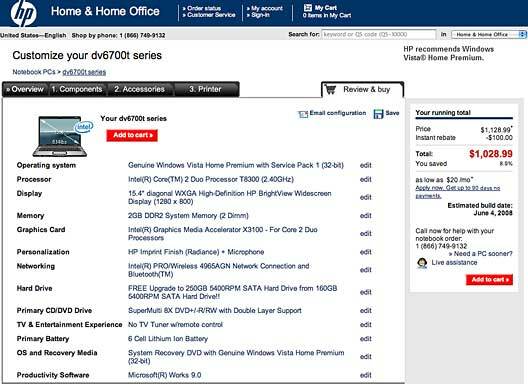 Sorting through the choices, I found that HP offers the dv2700t model with Core 2 Duo processors, just like the MacBook. The dv2700t model starts at a very low price, $775 (after a $100 instant rebate). It comes with the following: 1.83 GHz Core 2 Duo processor, 1 GB RAM, 160 GB hard drive, DVD burner, built-in webcam and microphone, wireless 802.11g, and Intel Integrated Graphics X3100 graphics. That is pretty close to the lowest MacBook, except that the $1,099 MacBook has a 2.1 GHz processor, Bluetooth, and 802.11n wireless. MacBook: 2.1 GHz Core 2 Duo processor, 1 GB RAM, 120 GB hard drive, DVD reader, built-in webcam and microphone, Bluetooth, wireless 802.11n, and Intel Integrated Graphics X3100 graphics. When I bumped the specifications up to closely match the base model MacBook - using a 2.1 GHz CPU, adding 802.11n and Bluetooth, and including a Windows Vista Home Premium recovery DVD - the final price was $959. That beats the MacBook price by $140. Points go to HP for having the better hardware specs and a cheaper price, but what about software? I will say that I got stumped on the software choices. 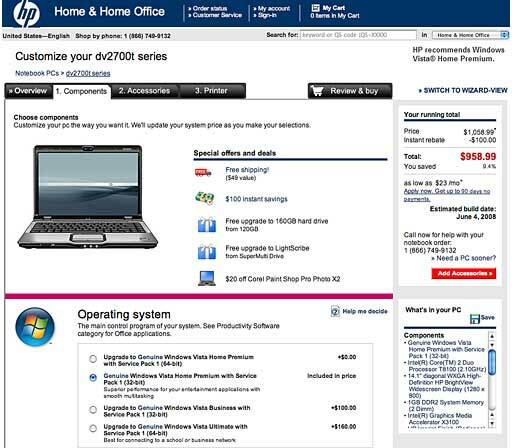 Since I haven't use Vista, and I won't call myself an expert on XP, it wasn't obvious if you really need to buy the software listed for that model. A Mac user is expecting iLife to handle many of the basic tasks. (I called the customer support number listed on the web page, and a live person was answering my questions quickly. They were friendly and helpful. I will give HP a star rating for service.) The answer seems to be "sort of" - there are things that get included, like PhotoSmart Essentials and Muvee AutoProducer Basic. I'm going to guess that these are not as well integrated as the whole iLife suite, but they'll get you started. I did think that it was tricky that the OS/Recovery DVD isn't included with the purchase price; it has to be ordered separately for $19. It is weird that HP doesn't automatically include it. It feels like the airlines, how they are trying to raise profits by charging you for anything extra. If you want to upgrade your software, there are a number of things that would quickly use up the savings on hardware. Vista Business adds $100 to the price, and Vista Ultimate adds $160. Norton Security is an extra $39 for a 15-month subscription. (When buying a PC, you have to remember that they do get viruses, so you have to protect your computer.) Roxio PhotoSuite 9 adds another $69. The upgrade to Muvee AutoProducer is another $99. for the most part Mac OS X and iLife take care of all these minor software choices. I'm going to say that on the included software side, there may be advantages to the Mac. Of course, this will depend on you and what software you may already own. One other difference: The HP includes a 3 hour, 30 minute battery. Add $39 for a 4 hour, 15 minute battery or $79 for a 7 hour battery. The MacBook includes a 4 hour, 30 minute battery. Upgrading the HP to the 4:15 battery reduces the price difference to $101. Let's jump over to the Dell website and see what they have that is close. The XPS M1330 is a really close match: it has a 13.3" screen like the MacBook. The only problem is that Dell classifies it as a Ultralight at 4.0 lb. (It measures 12.5" wide x 9.4" deep x 0.97-1.43" height.) The MacBook measures 12.8" wide x 8.9" deep x 1.08" height and weighs 5.0 lb. We'll go ahead and use the XPS M1330 for our comparison, and points go to Dell for making it lighter. This first thing you notice when you customize is that Dell has a "non-black tax" - you pay $25 extra for picking white, blue, or pink instead of the standard black. This is funny for Mac users who remember when people complained about Apple charging $200 more for the black MacBook. Dell is doing the same thing - but in reverse. The specifications are very close. Dell wins with the lowest price by $80. That is not much of a win on price. Dell also has the lighter laptop and a built-in fingerprint reader. On the software side, you get McAfee Security Center for 15 months, but no productivity software. Dell charges $130 more for Vista Business, and $150 for Vista Ultimate. Again, for what it's worth, the Apple wins on the software side of the purchase. Wait just one second. Closer investigation reveals that Dell is playing games on the "lightweight" design. Their weight specification is based on using a cheap 4-cell, 37 Watt-hour battery. The MacBook comes standard with a 6-cell, 55 Watt-hour battery. Dell is caught marketing a "lightweight" design that they achieved by reducing the battery weight and power. Laptops are all about mobility - who's going to want a smaller battery? Worst of all, they charge an extra $79 for the 6-cell upgrade. Now they cost just $21 less than Apple for nearly identical specifications. I'm going to call Apple the winner because of the better software bundle and not offering a stripped version of Mac OS X - unless you really can't live without a fingerprint reader. VGN-SZ740 - 2.1 GHz Core 2 Duo processor, 2 GB RAM, 120 GB hard drive, DVD burner, Intel Integrated Graphics X3100 graphics card, wireless-N, Bluetooth, and a fingerprint reader. At that price and with those specifications, the $1,299 2.4 GHz MacBook is clearly in the lead. The standard 4 hour battery may be underpowered too. Replacing it with a 5.5 hour battery adds $100 to the price. 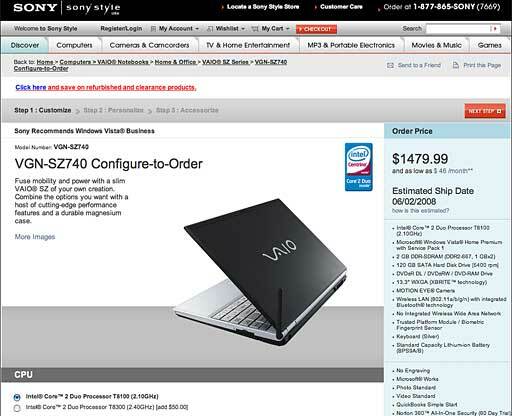 And bumping CPU speed to 2.4 GHz to match Apple adds another $50 to this VAIO's price. We'd better stick with the low-end brands like Dell and HP for this comparison. Sony doesn't beat their prices or Apple's. Let's do one final comparison, this time between a HP's dv6700t (the same as the HP model above, but with a 15.4" display) and a 15.4" MacBook Pro. While not a perfect match up, these two machines have close specifications. This time the Apple laptop is over than $900 more expensive. That can't be explained by the slight difference in the graphic card and display resolution. These two things are worth a few hundred dollars at best. The high capacity battery (3 hours, 30 minutes) for the HP adds an extra $39. Even adding in these items, the MacBook Pro doesn't come close to competing on price with this HP model. The MacBook Pro is a premium priced computer, but why? What's so special, if the components inside are close to those offered by HP? Most notebook PCs are made from nice looking but cheap to manufacture plastic. The MacBook Pro has a metal construction to give it a more solid feel. The MacBook Pro has many of these differences that are seamlessly integrated into the design so they don't look like tacked on extras (like the high capacity batteries for some PC notebooks, for instance). Apple's keyboard is lit from below, so it's easy to use in a dark area like a bedroom or coffee shop. There are ambient light sensors that control the brightness of the MacBook pro keyboard automatically. The MacBook Pro models are thinner (1" vs. 1.7" at the thickest point) and slightly lighter than the HP. The display uses LED backlighting, which is supposed to reduce power consumption, very important to laptops. The 15.4" MacBook Pro has a 1440 x 900 display; most 15.4" notebook PCs have 1280 x 800 displays. You often need to buy a larger, heavier 17" notebook to match Apple's resolution. The MagSafe power connector is on all Mac laptops but doesn't exist for any PCs. You get both FireWire 400 and 800 ports, which can be useful. That is a major collection of special features to set this model apart from the crowd, but are these things worth the extra cost? Are these things worth the extra cost? That is personal preference and a matter of how much cash you are ready to spend. Apple, unlike HP and Dell, doesn't configure its low-cost MacBook models to compete with the higher-end MacBook Pro models. If you want premium performance, the only way to get it is to go all the way. It recently came to light that for all computers over $1,000 sold through retail stores, Apple has the lion's share of the market - 66% both laptops and desktop combined. The article goes on to praise the Apple retail store as the reason these sales are so high. While the Apple retail store is an excellent place to shop, we simply cannot ignore the aggressive pricing Apple has taken for its computers to compete with a new PC in this price range. for this round of comparisons, Apple has competitive offerings. We see that on the base model MacBook, Apple did pretty well on price against HP. HP was able save you a few dollars and throw in some nice extras if you'd rather go the Vista route. for the midrange MacBook, Apple held it's own against the Dell XPS M1330 and trounced the Sony VAIO VGN-SZ740. On the pro level, Apple is much more expensive but delivers unique features that are unmatched on a PC. If you want a cheap computer, buy a PC, but don't complain when it's slow playing a video game or Vista Aero isn't working. If you're budgeting around $1,000, make sure you stop by an Apple Store and see what they've got to offer. At the very least you'll be able to look at all the Mac notebooks in less time in Apple's retail store than if you went to the HP website (which I just suffered through). One last thing I wanted to point out: Software requirements change so fast that the budget computer just doesn't hold up well. for all the computers that I've bought, both new and used, I've never later wished I'd gotten the lower-end model instead.